A holiday that promises greenery and serene beauty of hill station and the historical grandeur of past is a dream travel for everyone. "Mysore Coorg tour" presents the opportunity to experience the best of both the worlds in a simple trip. A perfect break from the monotony of our everyday lives, Mysore Coorg tour offers holidaying opportunity for everyone. Visit the historical building of royal Mysore, understand and experience the royal life; bask in the natural beauty of few of the best waterfalls in Coorg and admire the serenity of surroundings; the list of things you can do in Mysore and Coorg is extensive. However, sometimes time constraints and the stress of planning a tour stop us from experiencing a perfect holiday. We at "Holidays DNA" bring a hassle free holiday to our customers. At "mysoretourism.travel", a part of Holidays DNA, presents a wide array of tour packages of Mysore and destinations around such as Coorg, Ooty, Bangalore, etc. Whether you are looking for a Mysore tour, or want to club Mysore as well as other tourist destinations in a single trip; whether you want to tour package from Mysore to various destinations or planning to travel here, we have Mysore tour packages for every kind of travel plan. We offer an extensive range of Mysore tour packages from all the major cities such as Bangalore, Hyderabad, Chennai, Pune, etc. From honeymoon travel, a family trip with your kids and parents, last minute group travel to solo tour, our travel experts have designed packages to suit every travel need. Along with this we have Coorg tour packages from Mysore, especially created for travellers from Mysore. For travellers from other cities, we have Mysore Coorg tour packages as well, where we present the best of both the destination to our customers. Our packages cover almost everything related to your travel. From booking your choice of accommodation in both the cities, commutation within the city as well as from Mysore to Coorg, cabs/taxi booking, facility of guide if needed to fulfilling any special requirements of our customers, we ensure a stress-free trip for all our customers. The city of Mysore is bestowed with a historical richness that is unmatched to any other place. This land of Mysore Maharajas has a grand history behind it which is still reflected in its traditions and the majestic monuments. From the world famous Mysore Dussera which attracts tourists from all around the world to highly revered temple and equally captivating nature, Mysore presents an ideal holiday break. Some of the most popular sightseeing places in Mysore have been listed below. Mysore Palace– Also known as Mysore Maharaja Palace or Amba Vilas Palace, Mysore palace is one of the largest palaces in India. An architectural wonder, this palace was built by a British architect Henry Irwin in 1912. Residence of Mysore's Royal Wadiyar family, Mysore palace has been built many a times, each time surpassing the beauty of previous building. Chamundi Hills And Chamundeshwari temple- Chamundi Hills are about 13 km away from Mysore, standing at a height of 3,489 feet above sea level. The Chamundeshwari temple located on these hills is an important Hindu shrine. It is dedicated to Goddess Chamundeshwari (Chamundi) who is considered to be the deity of Mysore and Mysore Royal Family. One can has climb about 1000 steps to reach this temple. Mysore Zoo– One of the oldest and the largest zoos in India, Mysore Zoo is place for nature lovers. It boasts of rich flora and fauna. It is also known for its avian fauna, with birds from more than 40 countries. It is especially known for breeding and sustaining of endangered animals. Brindavan Gardens- An important part of every Mysore Tour, Brindavan gardens are of the best terrace gardens in the world. 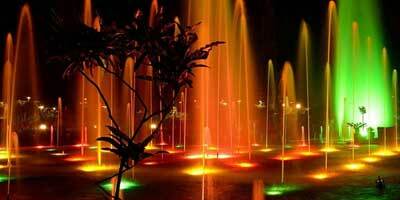 Its botanical parks, a wide array of beautiful plants, landscapes, and illuminated fountains are worth seeing. There is also the facility of boating here. These gardens are creation of Sir Mirza Ismail, the then diwan of Mysore state. Tibetian Golden Temple- It is located in Bylakuppe which is Tibetan residence which is about 90 km from Mysore. Also known as Buddhist Golden Temple or Namdroling Monastery, it radiates calmness, serenity and a mesmerising architecture. It was built in 1963 by His Holiness Pema Norbu Rinpoche. Jaganmohan Palace/ Jayachamarajendra Art Gallery– Jaganmohan Palace, which was built in 1861 as an alternate residence for royal family is now an art gallery named as Jayachamarajendra Art Gallery. This gallery boasts of more than 2000 painting by most of the celebrated painters from around the world. It has varied artefacts and rare collection belonging to the royals of Mysore. Also known as Kodagu, Coorg is one f the most popular tourist destination not just in south India but also in the world. Presenting untouched natural beauty, this place is gifted with mesmerizing waterfalls, viewpoints and religious sites. A few of the popular sightseeing places in Coorg are listed below. Dubare Elephant Camp- At the banks of Cauvery River, Dubare Elephant Camp is a must visit in Coorg. A place where elephants are trained for Mysore Dasara, here visitors can have firsthand experience of wildlife; from bathing, feeding and even playing with elephants to taking ride of the jungle and camping. Talakaveri /Talacauvery– Located in Brahmagiri hill, this place is known for its religious significance as well a breathtaking scenic beauty. There is also a small spring named Tirtha kundike or Brahma kundike. It is visited by devotees as well as by those looking for adventure and nature. Raja's Seat–The view of sunset and Sunrise is spectacular from here. It used to a place for Mysore kings to come and relax amid nature, hence the name Raja’s Seat. This place offer refreshing break from concrete jungles of the cities. Abbey falls- Located 10 away from Madikeri, Abbey/Abbi Falls flows beautifully in the midst of coffee plantation. It also offers amazing trekking opportunities, making a perfect blend of adventure and relaxation. The hanging bride here is also worth seeing. Madikeri Fort- First built in 17th century by Mudduraja, these palace has been renovated my many kings including Tipu Sultan and King Linga Rajendra Wodeyar II. Its majestic architecture still looks impressive. Coorg and Mysore are well connected to the rest of the country. There are regular buses from Bangalore to Mysore and Coorg. Many buses run between Mysore and Coorg as well, which takes about 2 hours of travel time as the distance between Mysore Coorg is only 107 km. Mysore is well connected via railways as well. However, there is no railway station or airport in Coorg thus it is accessible only via roads. Tourists can also hire a cab from Bangalore to Mysore and Coorg as well as from Mysore to Coorg.